BIG SALE!! 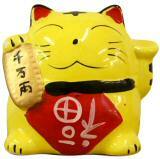 FENG SHUI WEALTH & LUCK CURES BIG SALE!! 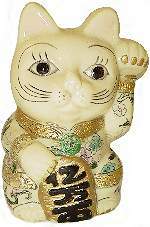 Heavy faux Ivory Japanese fortune cat, Tama is a gold embossed and hand painted reproduction of the traditional Ivory Lucky Cat carvings, with peony blossoms and Feng Shui symbols. Tama, a temple cat is famous for bringing great wealth and prosperity to a needy Japanese village by saving a rich feudal Lord. Cats have always been revered as incarnations of the mother goddess from Ancient Egypt to the Orient. 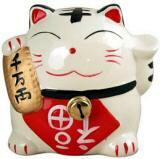 Porcelain Japanese Lucky cat money bank is hand painted in the traditional colors of red and black with gold accents. 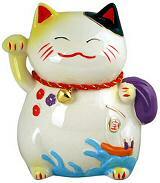 This endearing Lucky Cat has a working collar bell and the traditional Feng Shui banners with symbols of good fortune and happiness. Tama, a temple cat brought prosperity and abundance to a struggling Japanese village by saving a powerful feudal Lord from death by lightning in 17th century Japan. 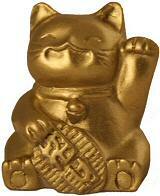 This Gold Lucky Cat carries the traditional Feng Shui banner with symbols of good fortune and happiness. Tama, a temple cat brought prosperity and abundance to a struggling Japanese village by saving a powerful feudal Lord from death by lightning in 17th century Japan. Stone resin figurine with a satin Gold finish.